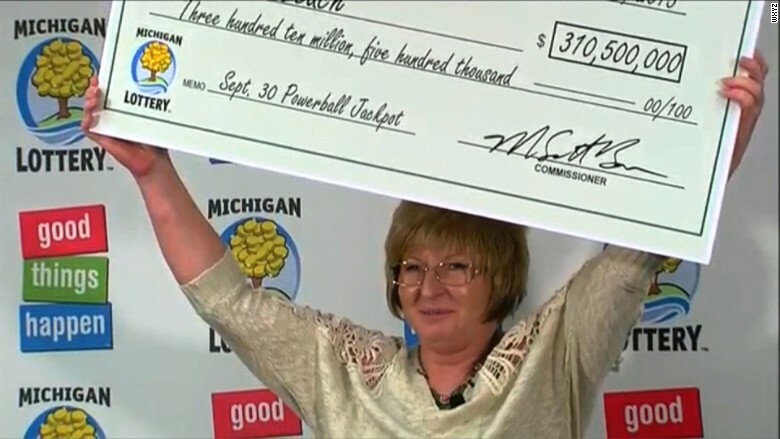 Julie Leach, 50, won the Michigan Powerball jackpot of $310.5 million -- the state's second-largest winner ever. Leach came forward on Tuesday to claim her prize, and decided to take the lump sum option of $197.4 million in cash. She joked that she was going to have her longtime partner, Vaughn Avery, sign a pre-nup. But she added that she plans to take care of her children and family with her winnings. "We used to say if we ever won the lottery, we wanted to buy a whole bunch of land and build all of our kids a home and basically have our own little community." Julie Leach just won Michigan's Powerball jackpot of $310.5 million. Leach said she bought the tickets on her way into work. "I worked a [night] shift and at about 6:30 at night I stopped to get my coffee and bought $20 worth of lottery tickets," Leach said. She said she'd had a rough night at the fiberglass factory where she's a supervisor, and checked her ticket while on her lunch break at McDonald's. "I didn't believe it," Leach said. "I had to go back to work and get verified from a couple other coworkers and just couldn't believe it." Leach said once she was certain she'd won, she quit immediately. "I was done!" Leach said.